Don Robinson is an award winning accomplished Hip Hop musician based in Austin, Texas. He has been named Hip Hop Artist of The Year nine times by the Austin Chronicle and has been involved in the music scene for over 17 years. His work in Hip Hop has always focused on the positive and inspiring aspect of what kids embrace about life. Having toured the U.S. many times this message has led to eight independent CD releases, national recognition by Billboard magazine and involvement in mainstream children's entertainment by writing for the movie soundtrack of "Spy Kids 3-D Game Over". 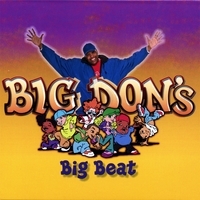 Big Don's goal is to entertain kids all over the world through the fun and energy of Hip Hop. Big Don will introduce a hip and new musical element to the art of story telling. He has turned some of the greatest classics that kids have ever known such as Humpty Dumpty, and Itsy Bitsy Spider into mainstream stories and danceable music that today's youth identify with. My kids love listening to this, and I like it too. You won't get tired of it (which I do of most music for kids). Great album, great concept!! And my kids love it! it a good hip hop for kids cause i love his songs and my sister love it. awesome cd. kids are loving it. we\'re doing a little hip-hop musical chairs every night. keep up the good work Big Don.